Many differerent things come together in Malacca. Not only the Europeon colonial influences and the Asian history. Especially the different kind of religions give this city a special aura. Moslems, Christians, Hindus and Buddhists living in peace next to each other. I also had a religious experience last night. A Hindu prayer leader speaking and singing at 3 am at full level like he´s going to die that night. But after staying awake and listening to the prayer leader I slept very well till 11:30 am. After a small breakfast I started to walk through Malacca and visit all the main attractions. 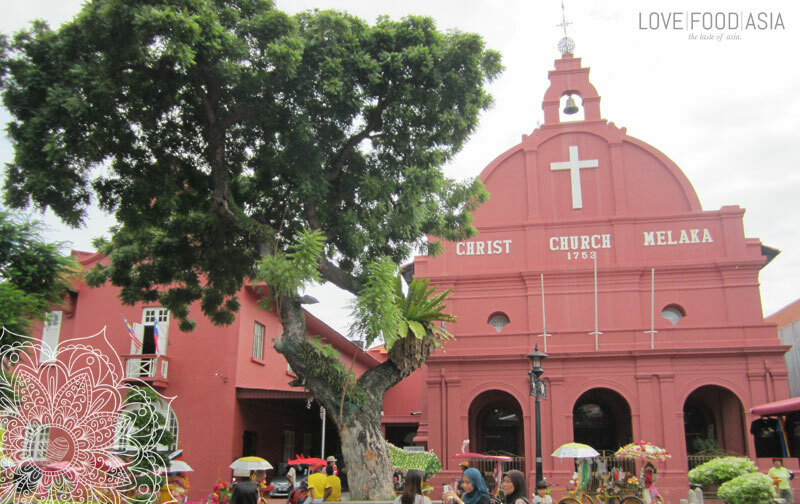 Next to my hostel was the Christ Church of Malacca. The built by the Dutch when they took possession of Malacca from the Portuguese, it’s one of Malacca’s most defining structures. From there I walked to A’Famosa. The old fortress is more than just a quick photo stop opportunity for tourists. Built in 1511, the settlement used to sprawl across a whole hillside but now only a lone gate (Porta de Santiago) remains. One of the oldest surviving European architectural remains in Asia; it is set beside the Istana ke Sultanan on Jalan Kota. A’Famosa is perhaps Malacca’s best known sightseeing spot. Originally constructed by Alfonso de Albuquerque (who led the Portuguese invasion on the Malacca Sultanate), the remains of the fort is now a crumbling whitewashed gatehouse and is located downhill from St. Paul’s Church. Then I climbed the steps to the St. Paul’s Church. It is the largest and oldest Chinese graveyard outside of China, Bukit Cina is the ancestral burial ground of Malacca’s Chinese community. Also known as Chinese Hill, it has more than 12,500 graves and these days the 20ha hill is primarily used as a jogging track. Set at the base of St. Paul’s Hill was my last sightseeing stop for today. The Melaka Sultanate Palace is a wooden replica of Sultan Mansur Shah’s 15th-century palace. It was painstakingly constructed in 1985 using traditional construction techniques and materials, based on accounts in the 16th century, Sejarah Melayu (Malay Annals) text. According to the annals, Sultan Mansur Shah’s seven-tiered palace was built entirely without nails and supported with carved, wooden pillars and featured a copper and zinc roof. On the evening I had a few beer in a small bar owned by a Malayan guy with Dreads who has lived as a Punk in Berlin during the 80th. We had long conversations about life in Malaysia, Germany (and the Punk scene) and traveling the world. Another perfect day in SEA came to an end.